As the garden settles into winter mode there are a few plants that are determined to defy the impending hostility brought forth by old man winter, showing no signs of slowing down. In fact, the plants in this post look more alive now than they did a month ago. 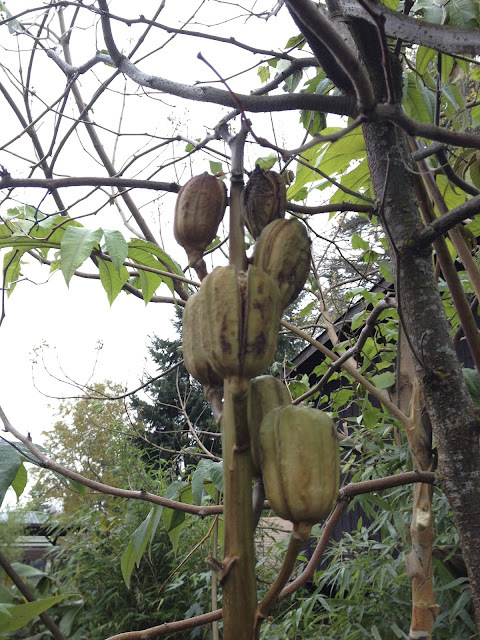 Case in point, the growing season for this plant is the winter. It goes dormant during the heat of the summer. I hardly believed that when I bought it, but now that I've seen it, it's true. It's called Arum italicum 'White Winter' and supposedly makes a great companion plant to hostas since their growth/dormant periods are reversed. It's also hardy to Zone 5 (-20F/-29C) so just about anyone can enjoy it. One genus that has a 99.99% fail rate in Seattle are aloes. I've tried several "hardy" aloes, giving them perfectly draining soil in a nice sunny spot, only to find a gooey mess after an arctic outbreak. I bought this aloe, labeled Aloe 'Johnson's Hybrid' last spring and was very happy to see it essentially quadruple in size over the summer. This will be its first winter in the ground and so far so good - it's even starting to bloom! Luckily the aloe is far from the only plant in bloom right now. This next one actually starts blooming in mid-fall and carries through to at least Christmas. 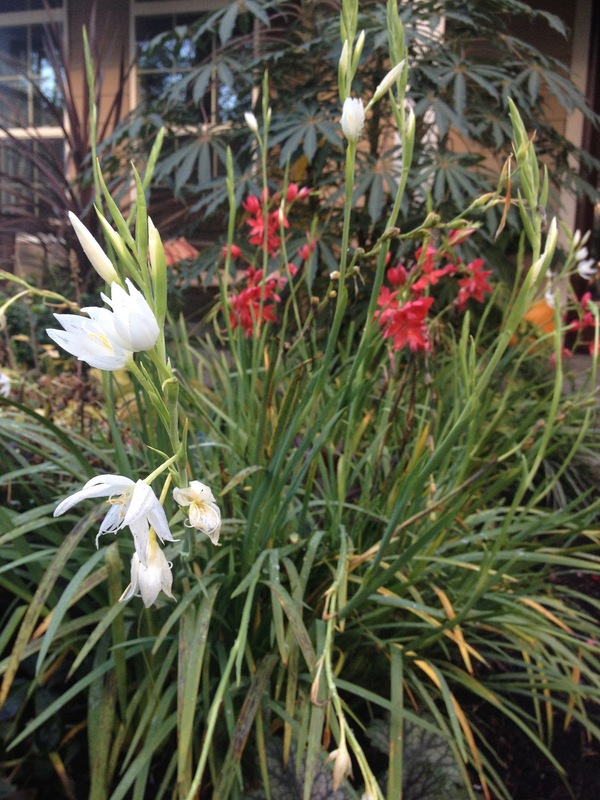 It is sometimes confusingly referred to as Kaffir lily, but its botanical name is Hesperantha coccinea. In the background is the venerable Schefflera taiwaniana. Two outstanding plants...there's a reason they're right by the front door! 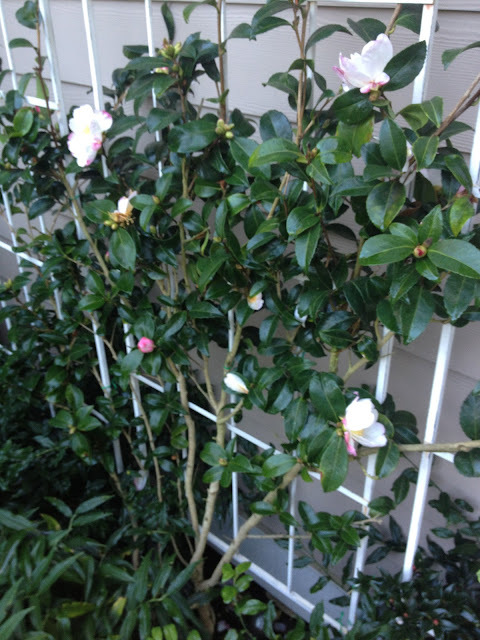 This Camellia sasanqua 'Apple Blossom' is really starting to grow into a nice espalier and conveys a subtropical look quite well even though it was only a few degrees above freezing when this picture was taken. I believe there's a lifetime supply of bird food on this Pyracantha coccinea (firethorn). November is the stormiest and wettest month in Seattle. This November has been no exception...we've already surpassed our average of 5 1/2 inches of rain for the month and experienced a few good doses of wind - hurricane-force in some areas. Although it is still mid-fall, November can easily bring lowland snow and prolonged subfreezing temps. But luckily there's been none of that so far! As warm, dry, and sunny gives way to cold, wet, and cloudy, there is still much to look forward to in the garden...collecting and germinating seeds, testing winter propagation techniques, winter bloomers, frost-sweetened brassicas, and a chance to stand back and re-imagine different areas of the garden. 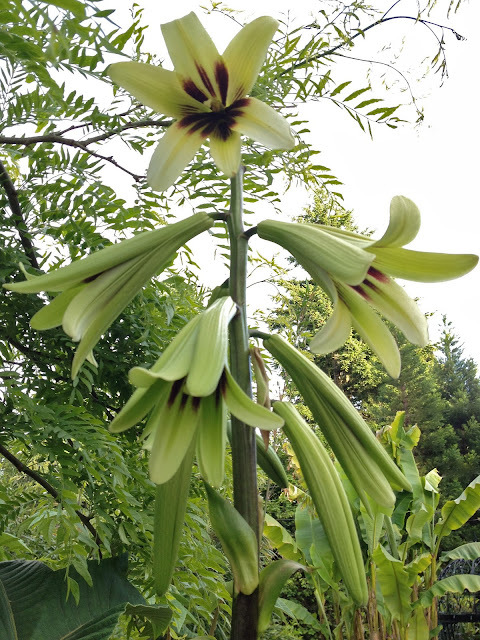 The Cardiocrinum giganteum (Giant Himalayan lily) I planted a few years ago went to seed and I am going to try my best to raise a cardiocrinum family. 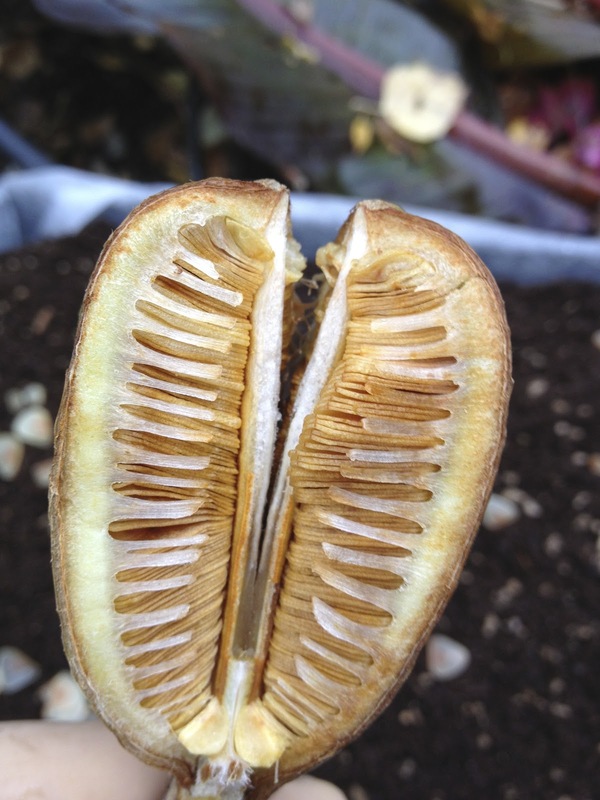 Each seed pod contained hundreds of flat, paper-thin seeds. Look at all those seeds! 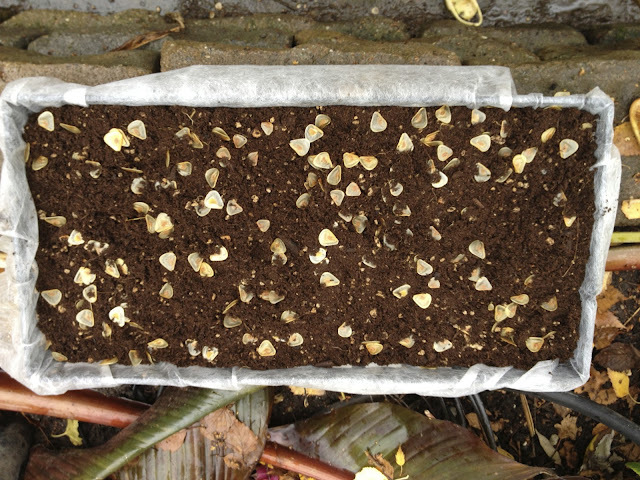 To germinate the seeds, I took a plastic-mesh tray and lined it with some left over row crop cover to keep the bugs away and filled it with some potting mix. 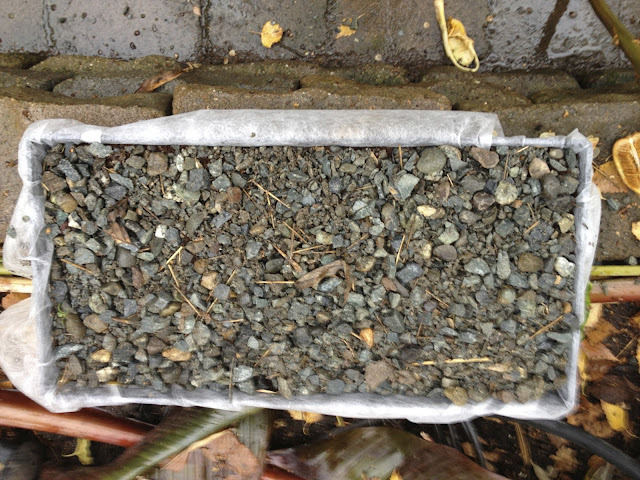 Then I sprinkled some of the fresh seeds right on top. 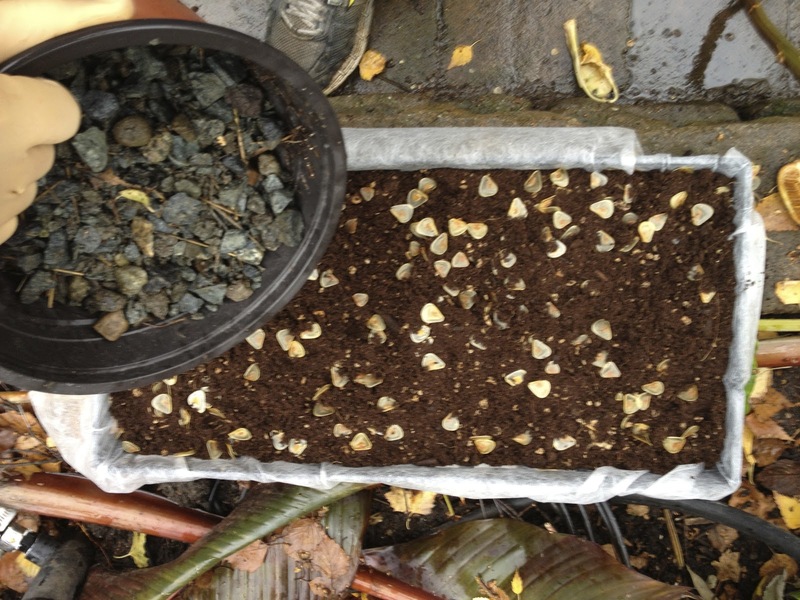 I read that it takes a while for Cardiocrinum seeds to germinate, so it is a good idea to cover the seeds with gravel in order to prevent a film of green slime from growing over the top.